Your yard is filled with construction waste from the renovation of your property? So why not take advantage of our professional rubbish removal Central London SE company. Better Cleaning Company provides effective and inexpensive domestic and commercial, after builders & garden waste disposal as well as recycling. Call 020 3746 3201 or fill in online request for a free viewing for an exact price quote now! We are experienced in building waste removal Central London SE of all kinds, with the exception of hazardous and health-related waste. Our staff will perform the bulky waste clearance and also debris removal after a your recent home construction. Save money, time and lots of efforts and let us collect and remove nearly any kind of waste from your property, book our professional rubbish removal service today! If you are having difficulties cleaning out and disposing of the excess builders waste following the refurbishment of your house, we are always prepared to assist you. 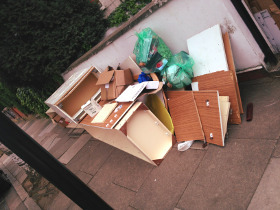 We provide top quality building waste removal Central London SE in accordance to all rules. Our waste disposal crew will carry out all the heavy loading & lifting, and can be very useful for bulky waste clearance and all kind of construction debris removal. Our personnel are vetted and qualified to correctly deal with your junk. They will arrive with a lorrie for loading and transporting the builders waste to the recycling site. We are going to recycle more than 80% of your waste. For fast and effective assistance in removing out unwanted things and rubbish from your home, book our professional waste disposal service right now! We are experienced in providing hassle free and fast garden waste collection Central London SE. We will collect all hedge, grass, tree trimmings, hay, leaves, unwanted plants and weeds, wood and other garden waste and will load and dispose of it at a reasonable price. Our waste management staff can deal with green waste removal, brown waste removal plus dumping and recycling. As a major rubbish waste carrier, we have put into place a quite easy booking system for our rubbish removal Central London SE services. Better Cleaning Company has a an effective hotline 020 3746 3201, available 24-7. You can get a totally free viewing or directly book a visit from us. We guarantee you rapid arrival. Our experienced 2 men squads to examine the situation and give you a price estimate. We do the recycling instead of you in a legal fashion!